We can register a few conjectures about what we might want to learn from these data – say, a breakout of monthly temperatures by years or groupings of years and/or states (the 48-contiguous ones, that is), and perhaps even by coarser, regional rubrics, provided of course those parameters are in there, and don’t worry – they are. And of course you’ll be anticipating a fitful but dogged rise in temperatures across the 118 years’ worth of data, something you should be able to demonstrate or disconfirm here. In any case, I’ve put the file contents in their pace starting at row 2 because the native NCDC data are headerless, and that just won’t do; you’ll thus want to reserve row 1 for some apt titling. When the smoke clears your sheet should have sawed the data into 13 columns, in which numbers 2 through 13 clearly report monthly temperature data. These’ll naturally be headed Jan-Dec, or something cognate. But it’s column one that holds out the more formidable challenge, and naming it is the least of it. That is, digits 1-3 attest a state or other regional code, such as basin or shelf (these are enumerated in the accompanying lookup table, and keep those data in mind). 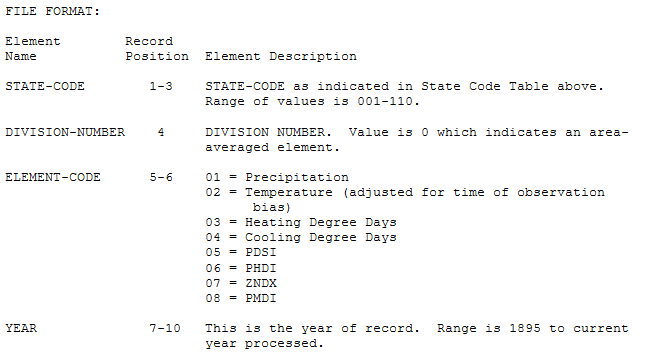 Digits 4-6 are unvarying across all the records, and as such can be ignored (digits 5-6 among our data always yield 02 for temperature, as per the above screen shot). And digits 7-10 always denote the record’s year, a datum we want to isolate in order to abet various pivot-tabled breakouts and the like. 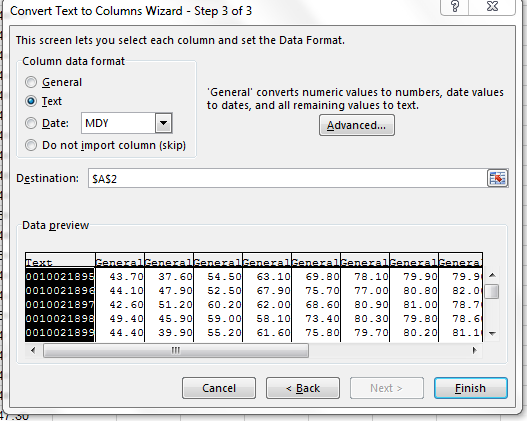 Thus you can insert a column to the immediate right of Code, name it Year, and format the column in Number mode. Why bother with that last step? Because the new Year column will inherit the prevailing formatting of the column to its left – in our case, text – any formula entered in the column will, absent user intercession, degrade into unreconstructed typing – that is, nothing but text. This expression cadges digits 7-10 from A2, etc., streaming the relevant years down the Year column in B (and you’ll probably want to lose any decimal points that may have squeezed their way into the cells). We need VALUE here because that 10-digit code in A2, etc. from which the year has been finessed is text, after all; and VALUE forces numeric status onto numeric-looking data that have been formatted as text. Translated, the expression Identifies the first three characters of any A-column entry, looks these up in the Areas lookup table (again, it’s stored in the Areas Lookup sheet), and returns the appropriate item (e.g., state or region name) from the table’s second column. Copy the formula down the C column. That looks good, but the issue I raised about 550 words ago remains unrequited: Namely, in the course of conducting the Text to Columns routine why did I insist that we invest the first, Code-bearing column with Text status in the first place? Because Excel deems the first two characters as leading zeros – numerically meaningless frippery – Text to Columns simply throws them out, leaving us with an 8-digit code for Alabama, and labelling its state identity 1, in lieu of the original 001. But New York, coded 030, suffers a loss of but one leading zero, and its data are thus remaindered into a 9-digit value. And the Eastern Region – code 121 – hoards all 10-digits, and all this digital disparity causes big problems for the VLOOKUPs – not insurmountable ones, mind you, but the round of additional hoop-jumping required to set all the data straight isn’t worth the bother. But once we format the Code data column into text form, thus overruling Excel’s General default, each record preserves its original 10-character span, and frees us in turn to invoke the 3-character state codes in every case – a more consistent take on the data. And yeah – there’s a bit more tweaking to be done, but once my word count hits four figures I know the natives get restless, and the collective slosh of watering eyes gets disconcerting on this side of the lectern. I’ll close this post, then, with a different kind of question, this one historical: you’ll observe that the temperature data for Arizona (002) dates back to 1895, as it does for all the other states. Yet Arizona did not enter the Union until 1912, a point I raised in an email to the NCDC. Meteorologist Mark Seiderman got back to me quickly, noting that data were nevertheless tracked in Arizona in its pre-statehood phase, but at a lower “station density” – meaning fewer readings were taken. OK, that’s it for today; meet me at the rathskellar in a half-hour. For some reason when I apply the VLOOKUP formula in the State/Region column nothing is returned and the formula remains. The code is formatted as text and I didn’t have a problem with inputting the year in the other column. Thoughts? Hi and thanks for your note. Is it possible that you transposed the order of the two inserted columns, that is, inserted State/Region to the immediate left of Code, and followed by Year? Also, did you format the column containing Years as numeric? One other point – I think the state and region codes in the Areas lookup table were mistakenly formatted as numeric when they should be text. I’ve posted a revised version of the spreadsheet to the blog post in the new format. Otherwise, I’ll be happy to look at the workbook as you have it if you email it to me. Thank you! That did help. You’re welcome – glad it’s working.